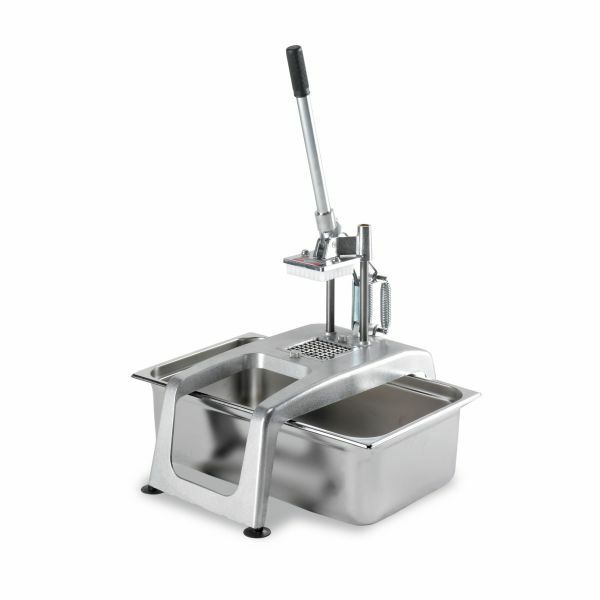 Ideal to make perfect french fries for restaurants and large kitchens. Equipped with a knife block and pusher set. 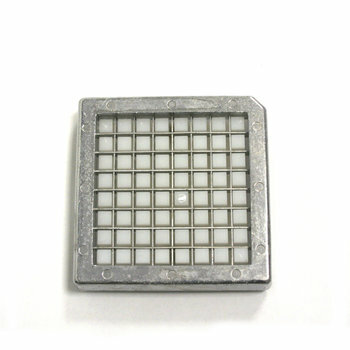 Light stainless alloy body: light and strong. Clean cut, without breaching or throw-away and without fatigue. The use of exchangeable knife blocks and pusher sets allows thicknesses of 8, 10 or 12 mm to be achieved. Controls and nuts and bolts in stainless steel. The pusher ejects the chips and leaves the grid free. Extended handle which provides optimal results with minimal effort. Comfortable use: The springs at the rear leave the grid completely free. The springs are highly flexible compensators which help to raise the presser-ejector. Equipped with suction feet to provide stability on the work surface. Blade units of various sizes and holding bowls for cut potatoes are available as optional accessories. Hourly production: 200 lbs. - 350 lbs. 1 Knife block + pusher set. Knife block + pusher sets of different sizes.